Red Hat has ben making steady progress toward what is shaping up as a fairly interesting cloud strategy. Building on their Deltacloud API abstraction layer and their CloudForms IaaS software, a hybrid cloud model is starting to emerge. Add to this their OpenShift PaaS system, and you can see that Red Hat is assembling a lot of key components. Let’s add the fact that Red Hat has gotten very involved with OpenStack, providing an interesting dynamic with CloudForms. Red Hat is the enterprise king in Linux (RHEL), strong in application servers (JBoss), and has a lot of very large customers. Their VM environment, RHEV (aka KVM) won’t displace VMware in the enterprise space any time soon, but it is pretty interesting in the service provider space. Red Hat’s community open source model will be very appealing to the market. In fact, any of the OpenStack distro providers should be at least a bit worried that Red Hat might leapfrog them. With their OpenStack move, CloudForms is being repositioned as a hybrid cloud management tool. Now their competition in the future might be more along the lines of RightScale and enStratus. What I’ve seen so far of CloudForms shows a lot of promise, though it’s still pretty immature. Red Hat is pushing a message about “open clouds” – which is less about open source than it is about avoiding vendor lock in with cloud providers. That’s something that CloudForms is intending to address. It’s also why OpenShift has been released as an open source project (Apache 2.0 – yay) that can be deployed on other clouds and non-cloud infrastructures. The big opportunity, IMO, is for Red Hat to go very strong on the OpenStack path for IaaS (e.g. release and support an enhanced Red Hat distro), really push their OpenShift conversation vs. Cloud Foundry based on their ability to drive community (along with it’s deep integration with JBoss), and move CloudForms further up the stack to a governance and multi-cloud management framework (their messaging on this is not very strong). It’s this model of openness – any cloud, any app, that will make their “Open Cloud” vision a reality. 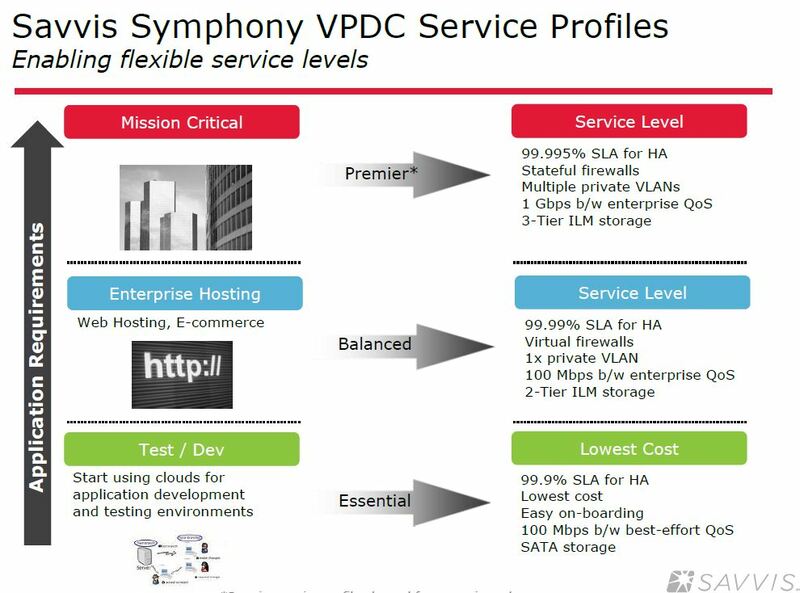 I was first briefed on the Savvis Symphony VPDC (virtual private data center) back at Cloud Expo NYC in April of this year and had intended to post about it back then, or at least when they went live in July… so much for good intentions… They are starting to market this more heavily now, so perhaps it’s not a bad time to get this done because VPDC has a few innovations that are worth noting. Perhaps the most interesting aspect of VPDC is their tiered QoS model. Think about it. Today clouds come in a one-sized-fits-all model. You either have the open Amazon model with minimal SLAs and fairly opaque underlying infrastructure based on commodity gear, or you get the “enterprise cloud” model with higher SLAs (and costs) based on enterprise-grade gear. Or something in the middle. But you can’t typically get two or three SLA/QoS configurations, with commensurate pricing, from the same cloud provider. With VPDC, that’s exactly what you get. VPDC never goes to the Amazon level – with very low cost instances and no SLAs – but they do offer two QoS tiers today, with a third tier planned. VPDC Essential is their starter level, with 99.9% SLA, best-effort QoS and inexpensive SATA-based storage. This is targeted at the dev/test use case. VPDC Balanced is the mid-tier offering, with 99.99% SLA, VLANs, enterprise QoS on a 100 Mbps network, and 2-tier ILM storage. They are targeting Balanced at the Web application use case. VPDC Premier (planned) will have 99.995% SLAs, more VLAN provisioning, 1 Gbps network, and 3-tier storage for more “mission-critical” workloads. As you move up, you get more prioritization of bandwidth, less storage contention, fewer VMDKs per LUN, faster drives, etc. Savvis would not give me any pricing information, but clearly you will pay more for Premier and likely even the Essentials pricing will be significantly more than Amazon or Rackspace. Lack of pricing transparency puts them a bit at odds with AT&T (Synaptic pricing here) and Terremark (vCloud pricing here). The only information I have I that pricing is hourly based on CPU, RAM and which operating system you are using (Microsoft’s SPLA fees presumably causing the difference). Interestingly they are disclosing bandwidth fees and are charging for bandwidth like a hosting provider ($50/Mbps 95th percentile model) vs. the more typical straight per GB in/out metered model. Savvis has no current intention of allowing credit card self-signup models for new users, even with their Essentials package. This could be a mistake as so many projects start off with a very small buy and the Amex charge is easy to expense. AT&T and Terremark might get those customers that don’t want to start with a sales rep, though the buyer seriousness is certainly better formed if they are willing to go through that pain. By and large, making it easier to sign up could be in Savvis’ best interests. VPDC is an enterprise cloud based on VMware virtualization, Cisco UCS blades, Cisco Nexus switching, HP Opsware provisioning automation, Compellent SAN storage, and other technologies – okay, good enterprise-grade stuff. Savvis relies heavily on deep integration with UCS and Nexus to get the QoS tiering to work with VMware. They also rely heavily on the flexibility of Compellent’s “Fluid Data Storage” virtualized storage software. All images are monitored using TripWire and connectivity can include MPLS and VPNs. What’s VPDC Mean for the Cloud Market? Amazon, Rackspace and others have grown largely on the backs of Web developers, SMBs, and enterprise usage outside the control of corporate IT. This is but a fraction of the potential future market as the enterprise moves more and more to the cloud. Enterprise IT buyers are much more precise and demanding when it comes to infrastructure than most Web and game developers. 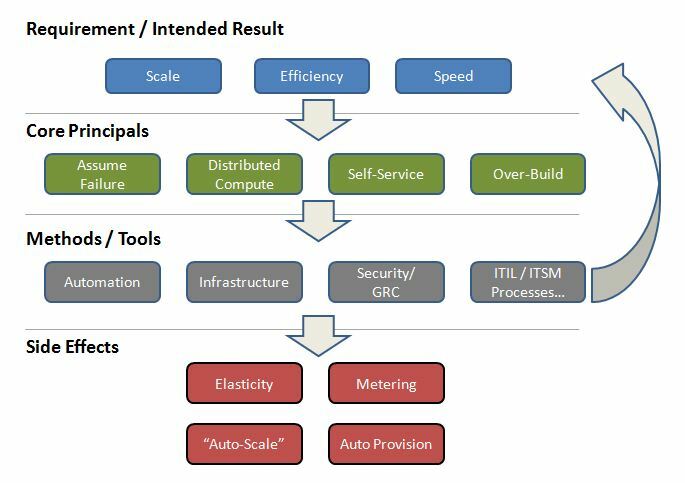 Having tiered SLA/QoS levels, with pricing to match, might become an important consideration for even the mass-market cloud providers if they want to win in the enterprise. The market is just too big to ignore. Alternatively, you could see the mass-market guys go the opposite route – adding the “five nines” SLAs and high QoS capability to their core commodity-priced offerings. This is a technology and scale issue that Amazon and Google are probably in a good position to leverage. After all, if you can get VPDC Balanced for the price of EC2 reserved instances, it will be pretty hard for Savvis to compete. But that’s a big if. In any case, Savvis has done a nice job leveraging the technology now available to create a differentiated offering based on QoS and SLAs. VPDC is available through data centers in the U.S. and U.K.